Welcome to Heritage Vembaru...... Heritage Communities....... Living at Heritage place........ This site is a treasure trove of historical information about a elegant coastal hamlet ‘Vembaru’ situated in the Gulf of Mannar of South India. Engineer Xavier Bastian Fernando and his beloved wife, with a flamboyant name, Gnanasourubi, did beget eight children of whom four they gave to be consecrated to God's service. 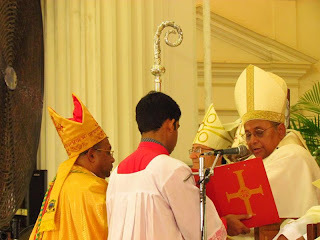 Thus, Joe of the Diocese of Jaffna and Emmanuel of the Colombo Archdiocese became priests whilst the girls in between joined the Apostolic Carmalite Congregation. More was in store for the Fernando family who made Kotahena their cherished abode. Years later, on February 11, 2012 Emmanuel will be called to reach the fullness of priesthood – Sacerdotal Plenitude. Henceforth, he will be known as His Lordship Most Rev Dr Emmanuel Fernando and will don the Royal Purple. One wonders how this humble servant of God will bear the weight of this grave title. Undoubtedly, the new Bishop will dedicate himself to serve God's people with renewed vigor and a burning passion. The Fernandos hailing from the parish of Vembar Holy Spirit tucked in a corner of South East India, belonged to the Diocese of Tuticorin. Their communities known as Bharathas were the converts of the Jesuits in the 16th century whose faith was enkindled by St Francis Xavier. Through thick and thin, they cherished their faith even as they spread their wings to distant shores, to reach Mannar, Negombo, Colombo and beyond. They were astute business people who dominated petrol outlets, liquor business and the textile trade in Ceylon, as the country was then known. The Jesuits in South India with their incomparable educational institutions drew many Bharatha lads to pursue academic careers as well as excel in sports. Hockey and soccer became the trademark of the Bharatha youth. In our country they chose St Benedict's College, Kotahena as their prime educational institution as many Bharatha educationists had already become La Sallion Brothers (then known as Christian Brothers). 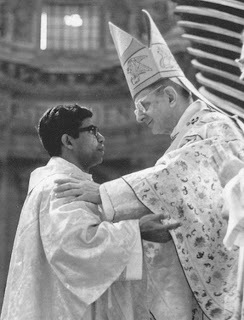 The Bharatha community helped the Catholic Church in various dioceses in Sri Lanka with immeasurable generosity and at a time facing backlashes from anti-Catholic elements of the ruling regime who after the school take-over crisis – took over the lucrative dry fish trade then dominated by them. Amidst this background there were also members of the community who became professionals in diverse fields. The senior Fernando was one of them though coming from a different educational background in Jaffna – St Patrick's College and Guindy Engineering College, Madras, India. The Fernando boys Joe, John and Emmanuel studied at St Benedict's College and the girls Assumpta and Micheline at Good Shepherd Convent, Kotahena. The Cathedral parish was their spiritual nursery that helped them mature to consecrated life. Young Emmanuel (born in Jaffna) was a Colombo boy through and through and a Benedictine to the core. Guided by the noble La Sallians of the calibre of Brother Francis and Paul he matured spiritually well enough to join St John Berchman's Society of Altar Servers of the Cathedral Church. The Burmese friar known as ‘Brother James’, a legend in his time was the moderator. He groomed the Altar Servers not only in Latin and the rubrics of the complex liturgical services but also drilled them in rigorous discipline. In many ways, Brother James’ training surpassed even what was provided in a minor seminary, so much so, there was hardly any substantial difference between ‘this and that'. As the teenage Emmanuel entered St Aloysius Seminary post Ordinary Level, another product of the La Sallian Brothers – Malcolm Ranjith who recently became Sri Lanka's second Cardinal, too joined the institution. After a short stint in the Borella Seminary under the guidance of the great visionary Fr Frank Marcus, who subsequently became the Bishop of Chilaw, Emmanuel joined the Ampitiya Major Seminary. In those tumultuous days of 1966, the seminary was in the hands of some brilliant OMI (Oblates) priests led by Very Rev Fr Dalston Forbes, a multi-talented formator. The late Cardinal Thomas Cooray had the keen sense of spotting seminarians just right to be sent to Propogand Fide Seminary in Rome. Incidentally, Cardinal Cooray also had the knack of spotting water deep underground by a magnetic sensation he felt by the dangling metal clock on a chain. Years swiftly passed from the time Bro Emmanuel became a priest ordained in Rome by Pope Paul VI. He soon gained experience in the parish apostolate and later taught at the National Seminary, Ampitiya. He continued his studies at the prestigious Catholic University of America for the Doctorate in Moral Theology. A few years after resuming his teaching post in the Ampitiya Seminary, he took charge the institution as its Rector. Rectors of Seminaries, it now seems, are earmarked to become Bishops. The list includes the late Bishop Frank Marcus, Emeritus Archbishop Nicholas Marcus, Bishops Marius Peiris, Valence Mendis and now Mgr Emmanuel Fernando. What was special over and above all other high attributes, this hard-working priest Fr Emmanuel who currently holds the ecclesiastical office of Episcopal Vicar, was assigned to minister to the spiritual needs of Tamil Catholic community in the Archdiocese. 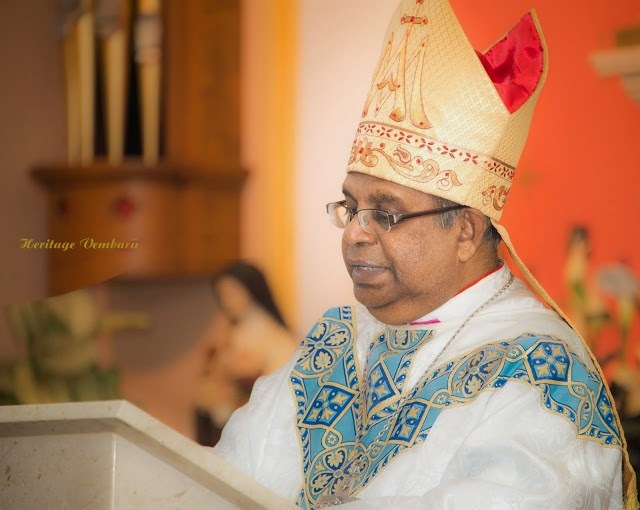 Although there was much expectation about the appointment of Auxiliary Bishops to assist the heavily burdened Malcolm Cardinal Ranjith, Fr Emmanuel seemed to lead the list. The confirmation did come on November 28, 2011 when the appointment came with the titular title ‘Bishop of Orta'. Thus His Lordship Bishop Emmanuel Fernando became the seventh Bishop from the Bharatha community who they consider themselves to be the children of St Francis Xavier. Incidentally, the first Latin rite Bishop of India was the Bharatha Bishop Tiburtious Roche who too was a Benedictine. Bishop Thomas Fernando succeeding him as the head of the Tuticorin Diocese was the second. His family also produced two priests and a Bishop. The other Bishops are His Grace Peter Fernando, Bishop Leon Dharmaraj, Bishop Thomas Aquinas, Bishop Anthony Devotta. 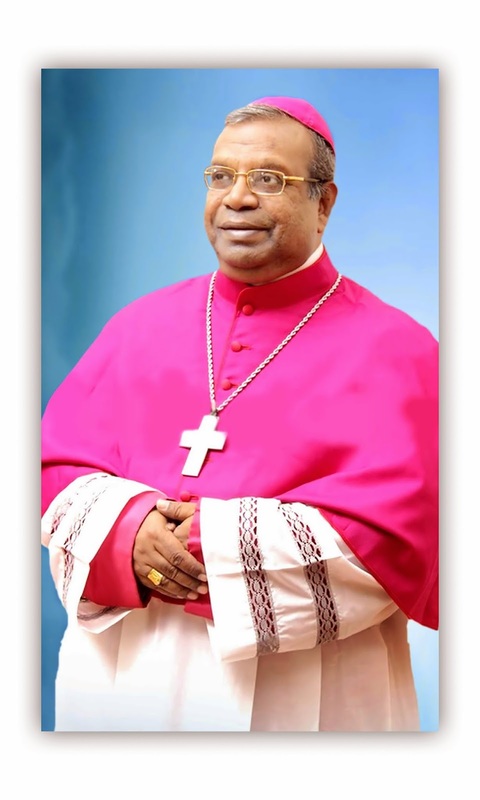 Bishop Emmanuel Fernando is the first Bishop of the Bharatha community in Sri Lanka. The list of La Sallian Bishops in Sri Lanka includes, the late Bishops Roche (Tuticorin) Beckmeyer, Emalianus Pillai, Archbishop Emiritus Oswald Gomis, Malcolm Cardinal Ranjith, Bishops Marius Peiris, Winston Fernando and Valence Mendis. Indeed the vision of St John Baptist De La Salle continues to become brighter at a time and place far from his own era and society. On the morning of February 11, as the chimes of the bells of St Lucia's Cathedral resound to announce that one of its sons has been elevated to the office of Sacerdos Magnus we shall pray together with the vastly expanded Fernando family with glowing hearts Te Deum Laundamus - ‘We thank you O’ Lord'. Indeed, the Lord of history has his own strange ways to choose his leaders to take the church forward, in an exceedingly complex world. This site is a treasure trove of historical information about a Bharathavar/ Bharathar/ Paravar Community and a elegant coastal hamlet ‘Vembaru’ situated in the Gulf of Mannar of South India.